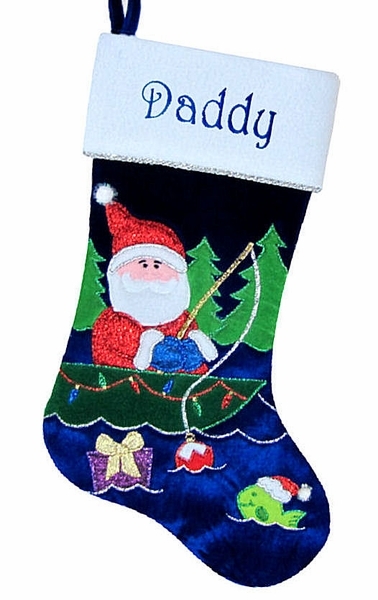 Fisherman Santa Fishing Christmas Stocking personalized for the fishing enthusiast in your family. This is 18.5" Velvet Christmas stocking with gorgeous applique in metallic embroidery that can be custom monogrammed with name of the fishing guru ! Materials: The stocking is made from deep blue and white velvets with bling metallic embroidery applique threads for that Christmas BLING BLING effect! The inside lining is from polyester satin material. The cuff is trimmed with silver rope. Names can be personalized on the cuff of this Christmas stocking with ROYAL BLUE or or other metallic embroidery thread to compliment the colors of the stocking. We have a sample picture of the stocking monogrammed with royal blue metallic embroidery thread ... click on the thumbnail image in the top right hand corner of this page to see a larger version.